We are accepting the challenge of offering you a new way to become a Software Developer. 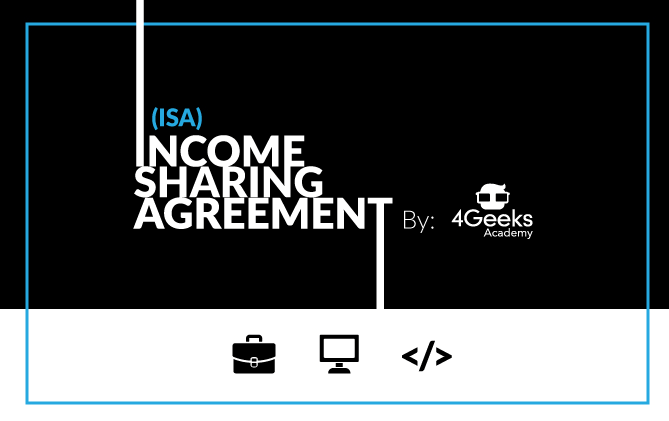 4Geeks is now offering an ISA (Income Sharing Agreement) for anyone looking to enroll in our Full-time programs. 9 Weeks will take you to get the skills + 10 weeks (average) to find a new job, and you will only need to start paying your tuition once you land a Job above $35,000 per year (pre-tax). Coding Education has become an important asset for those who are willing (i) to change careers; (ii) launch a new startup; (iii) undertake new projects; or (iv) enhancing their ongoing careers with new skills. However, the tuition fee has been a burden for those who are committed to Learn To Code but does not have the resources to undertake such a commitment. Education shall not be a matter of How Much, but a matter of How committed you are. The ISA payment option will be offered to full-time students under certain conditions: previous knowledge, background experience, time commitment, interest and goals to find an immediate job in Coding. It’s not only about finding a job, but it’s also about finding the right path. The ISA program launched by 4Geeks will let our students waive their tuition until you find a job with the option to start payments only if that position is offering them at least $35k per year. If it’s less, there is still no payment commitment. It’s about you, your career and the way education shall work. Our Full-Time program is meant for those who are putting everything at stake in order to achieve a career in Coding. Our Career Support team will be helping you throughout the program and after classes are completed. After finishing your 9 weeks immersed in Coding, our team will work together with you towards having everything ready for your new Career. The Admissions process is pretty straight forward. Everything begins with your application here, and then our Admissions Department will schedule an interview with us. After the interview, we will let you know if you are a candidate to get the benefits of our ISA program. The next step is about you completing the Pre-Bootcamp course (Pre-work) and the test included as part of your application. If everything works out accordingly, you will need to fill out the paperwork (Enrollment Agreement and ISA documentation) in order to complete your admission to the program. And that’s it, you will be enrolled and enjoy the benefits of becoming a software developer and pay only once you land a job over $35k (per year). If you want to get more info about 4Geeks, our programs and how the ISA works, please get in contact with us. We are always ready to help you throughout the process. Click here if you want to know about our Partnership with Leif (ISA partner program).